Centerra Gold Inc. (Centerra) is a gold mining company focused on operating, developing, exploring and acquiring gold properties primarily in Asia, North America and other markets worldwide. Centerra is a leading Canadian based gold producer and is the largest Western-based gold producer in Central Asia. Centerra’s shares trade on the Toronto Stock Exchange (TSX) under the symbol CG. The Company is headquartered in Toronto, Ontario, Canada. The Kyrgyz Republic, via Kyrgyzaltyn JSC, is Centerra’s largest shareholder owning 77,401,766 shares. Centerra is a leading Canadian-based gold producer, having produced 785,316 ounces of gold and 53.6 million pounds of copper in 2017. Major assets include the Kumtor Mine in the Kyrgyz Republic, which has produced more than 11.5 million ounces of gold between 1997 and the end of 2017, the long life, low-cost gold/copper Mount Milligan Mine in British Columbia, Canada, the Öksüt Gold Project in Turkey, which is in construction, the late stage Kemess development project in British Columbia, Canada, the Greenstone development project in Ontario, Canada, the Endako and Thompson Creek primary molybdenum mines in British Columbia, Canada and Idaho, USA, respectively, which are currently on care and maintenance and the Langeloth Metallurgical Facility in Pennsylvania, USA. The Company is constructing its third gold mine, the Öksüt Gold Project in Turkey, which is expected to be producing gold in the first quarter of 2020. We are the largest Western-based gold producer in Central Asia with Company-wide estimated proven and probable reserves of 16.3 million ounces of contained gold and 2,568 million pounds of contained copper as at December 31, 2017. Kumtor is the largest foreign-owned gold mine in the former Soviet Union. Mount Milligan became the first new large mining operation in British Columbia in a generation. In January 2013, Centerra became the sole owner of the Öksüt Gold project in Turkey. 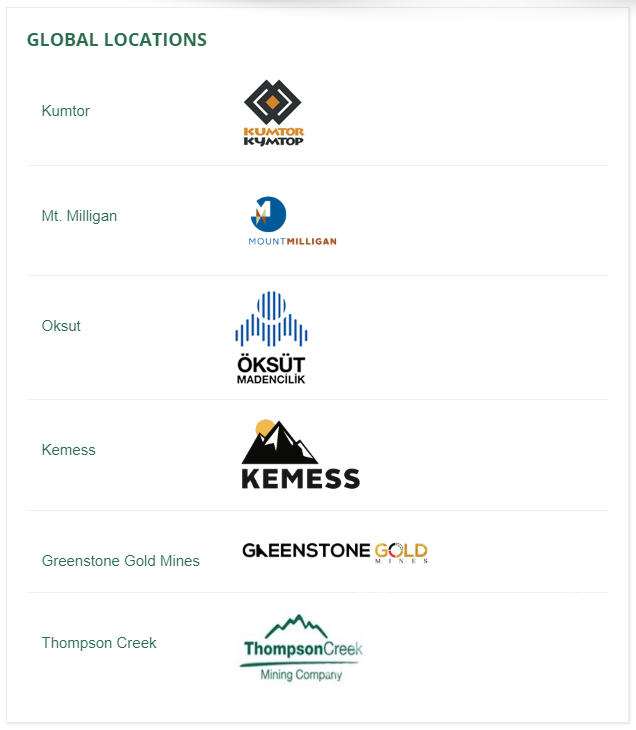 In March 2015, Centerra became a 50/50 Joint Venture partner in the Greenstone Gold Property located in the Geraldton-Beardmore Greenstone belt in Ontario, Canada. In October 2016 Centerra acquired Thompson Creek Metals Company Inc., total transaction value of approximately US$1.1 billion. In January 2018 Centerra acquired AuRico Metals Inc., total transaction value of approximately C$310 million. In October 2018, Centerra sold it Mongolian Assets for US$35 million to OZD ASIA PTE Ltd., a private Singapore based company. Centerra has exploration properties or has formed promising exploration joint ventures in Armenia, Canada, Mexico, Nicaragua, Sweden and Turkey. Centerra has allocated approximately $17 million for exploration activities in 2018. Additional information on Centerra and the full report about the Company’s activity is available on SEDAR at www.sedar.com and the Company’s website at www.centerragold.com.